The fossilized remains of a Late Cretaceous dinosaur embryo that famously graced the cover of National Geographic in the 1990s have been identified as a new species of oversized oviraptorosaur. Weighing nearly 2,500 pounds as adults, these dinos were the largest roosting animals to ever appear on Earth—tending to nests as big as a monster truck tire. A new study published in Nature Communications has finally confirmed the identity of the so-called “Baby Louie” fossil—a remarkably well-preserved dinosaur embryo that was discovered in Henan, China, back in the 1990s. The giant bird-like dinosaur, named Beibeilong sinensis (meaning “baby dragon”), lived between 89 and 100 million years ago. A joint Chinese-Canadian-Slovak team of paleontologists came to this conclusion after studying a batch of eggs associated with the embryo, and by conducting a comparative anatomical analysis of similar dinosaurs. A detailed study of the ancient embryo was only recently made possible, after the fossils were finally repatriated back to China from the United States. The Henan region of China has yielded a treasure-trove of dinosaur eggs over the years. During the 1990s, scores of fossilized eggs—many of which were uncovered by peasants—were shipped and sold overseas in rock and gem shows, stores, and markets. The Chinese government struggled to control the export of these valuable scientific items. A collection containing the rare dinosaur embryo was acquired by the Stone Company, and was subsequently featured on the May 1996 cover of National Geographic where it received worldwide attention. The fossil was dubbed “Baby Louie” in honor of its photographer, Louis Psihoyos. In 2001, the Indianapolis Children’s Museum acquired the collection from the Stone Company and put it on display, while declaring its intention to repatriate the fossil and eggs back to China. After nearly a dozen years of negotiations, the collection finally returned to a Henan museum in 2013. Back in the 1990s, the embryo was correctly identified as a type of caenagnathid oviraptorosaur—a feathered, long-necked, wing-bearing, beaked dinosaur closely related to birds—but paleontologists weren’t sure which species of oviraptorosaur the tiny fossil belonged to. Research on the collection ground to a halt while the children’s museum negotiated with China, but now that it’s back with its rightful owners, the collection has been made available for renewed scientific inquiry. The new study was led by Junchang Lü from the Chinese Academy of Geological Sciences, who recruited Darla Zelenitsky from the University of Calgary to help, among other experts. Baby Louie is the only known skeleton found in association with a clutch of large oviraptorid eggs, known as Macroelongatoolithus. The eggs measure nearly 18 inches long (45 cm) and weigh roughly 11 pounds (5 kg), making them some of the largest dino eggs ever discovered. The Macroelongatoolithus were found in a ring-shaped clutch, which was once part of an enormous nest that measured 6 to 10 feet (2-3 meters) in diameter, and contained as many as two dozen eggs. Based on previous research, the researchers concluded that dinosaurs from such eggs can reach over 2,425 pounds (1,100 kg). The embryo itself measures 15 inches (38 cm) long from snout to tail. 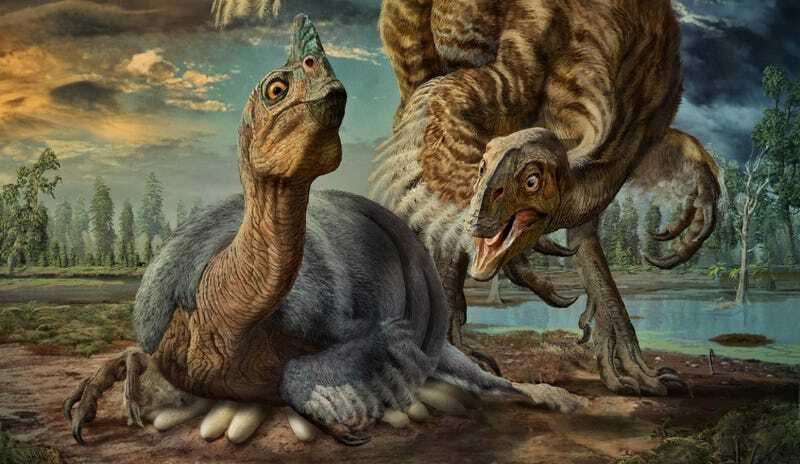 Analysis of the bones suggests the dino chick died while hatching prematurely from its egg, and that it belonged to a previously unknown species of giant oviraptor. The researchers don’t have any adult fossils of this creature, but a comparative analysis of close relatives (about a dozen caenagnathid species have been identified) suggests a full-grown Beibeilong sinensis measured about 26 feet (8 meters) long, and weighed about three tons in body mass. The researchers say it’s the largest known dinosaur to have sat on its nest and cared for its young. (Other, larger dinosaurs also laid eggs, but their nests were open and not regularly incubated, similar to some birds). Indeed, it’s astounding to think that an animal like this actually existed. Thanks to these scientists and the work of artist Zhao Chuang (below), we can at least catch a possible glimpse of what it looked like. Though it’s impossible to know for sure, the presence of so many eggs at a single nesting site implies that poaching was a problem for these animals—that dino chicks were regularly picked off by predators. A large quantity of eggs would guarantee that at least some chicks would survive into adulthood. That said, the presence of so many Macroelongatoolithus in both Asia and North America suggests that large caenagnathid oviraptorosaurs like Beibeilong sinensis were widespread and common during this time, despite the poor fossil record.